A major cruise ship company was coming to the end of their dry docking and refurbishment programme when it was discovered that one of the main engine central coolers was leaking. On inspection it was discovered that the end frame plate was very badly corroded and pitted. Normal repair practice would be to cut a hole in the side of the ship, remove the frame plate from the engine room and after grit blasting decide whether to weld repair and/or machine back the plate. Time, money and inconvienience. We proposed a quicker solution. By using a Belzona product especially designed to bond to a "gingered" surface our service engineers repaired the heat exchanger in two days. The corrosion was removed by angle grinders & needle guns. The plate was washed with fresh water to remove salt contamination before a final cleaning by angle grinders. The Belzona Marine metal was applied across the damaged areas with a scrubbing action to achieve good surface contact. Once the Belzona was build up to the correct thickness it was dressed back using a straight edge to achieve as near flat a surface as possible. Two coats of a fluid coating system Belzona 1341 was applied to further protect the end plate. It was now time to address the cracked end plate. This was easily achieved by fitting two end plate gaskets to the first two plates and effectively isolating the first plate. This had the advantage of not changing the tightening dimension of the heat exchanger. The heat exchanger repair was allowed to fully cure for 24 hrs before the plate pack was retightened and put back into service. 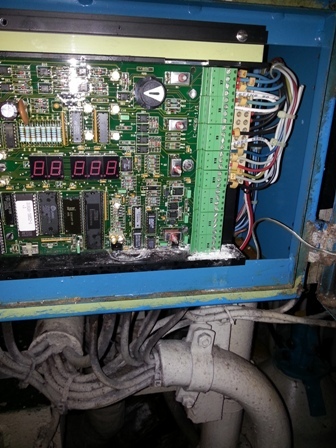 A UK ship management company had a major problem with a MKK separator bowl. The ships crew had managed to jam the HFO separator bowls lock ring in place. On top of this they had then resorted to using a gas torch, grinder, hammer and chisel to try loosen the jammed lock ring. This made things worse and all the bowls seals started to melt. Finally they gave up and called the ships superintendent. The bowl arrived in our works battered and bruised for repair. After inspection it was decided that the lock ring would have to be machined out. The bowl was set up on the vertical borer and the old lock ring machined out. We then cleaned up the square section bowl thread and started to fit the new lock ring. This was eventually achieved by the use of fine grinding paste and Belzona Belesta low friction oil additive. Due to the damage done to the bowl it was then necessary to rebalance the bowl and remark the lock ring tightening marks. The bowl was returned to the ship at a fraction of the cost of a new bowl. We recently were asked by a Major Ship Manager to carry out an inspection of all Fuel & lube oil separators and plate heat exchangers on two newly activated ships. The vessels had been in cold layup for 4 years in the Far East. We carried out the initial inspection and found major faults on both vessels separators. This included: Missing parts, Corrosion, salt damage to control panels, major faults on the separator running gear, damaged auxiliary systems. It was decided that all separators would have to be completely stripped and further checks carried out. In the mean time our heat exchanger team, stripped out all plate heaters on board each vessel and transported them to our workshop. After cleaning & crack detection it was found that we had a major problem with chloride attack due to leaks in the central cooling system. Many of the auxiliary plates were stainless steel and these had been pin holed with the chloride attack and therefore had to be scrapped and replacements found. That was nearly 2000 plates cleaned; crack detected, replaced, re-gasketed and refitted onboard both vessels with in 10 days. The separators took a little longer, but after nearly 6 weeks working in very difficult conditions all 18 separators were ready for service. This job was very difficult due to the long lay up of each vessel and lack of any service records. But we managed to complete the job prior to both vessels sailing on time. A local oil waste recyling company had a major wear problem on their Alfa Laval MAPX 313 oil separator. The separator has been used to clean contaminated waste oil. This resulted in the sealing face of the sliding bowl being eroded away. Subsequently the bowl would not seal and the separator failed. The normal solution would be to buy a spare from the OEM or find a second hand replacement. Both these solutions were expensive and difficult to achieve due to the age of the machine. We offered an alternative solution not recommended by the OEM. We offered to reclaim the part with a weld repair. This needed careful planning to ensure the part was not deformed during the procedure and the correct weld material was utilised. After consultation with our welding experts, the procedure was put together. Pre-heat the part to the recommended temperature and hold. Select the correct weld material. Start welding, small areas at a time. Allow to cool. After welding was completed, allow to cool slowly. Set the part up on the vertical boring machine and machine. You can see from the photo's that the job was a total success. The customer was so pleased, that he decided, after testing the separator for two months to have a second machine repaired in the same way. We understand that the bowl should have been balanced after such a procedure, but the customer decided that he wanted to try the sliding bowl first to see if this was necessary. It was not and the machine ran within the OEM vibration levels. We don't advocate that this method of repair should be carried out in all cases and should only be attempted by experts in their field.